Scarab is the common name for any of various large, bright-colored beetles of which about 30,000 are found worldwide. In addition to their brilliant coloring and bulky size, up to 15 cm (6 in) in length, scarabs are distinctive for diverse horns or protuberances growing on the head or thorax; those on the males of many species are used in combat. Scarabs are divided into two groups, the scavenging dung beetles, which feed on decaying plants, and the chafers, which feed on young plants. All species possess layered antennae as sense organs. The dung beetles lay their eggs in balls of dung, on which their young feed. Other species, such as the leaf-eating June beetles, also known as May beetles, deposit white eggs in the soil. Some 1300 species of scarabs are found in North America; one of the best known is the Japanese beetle. Scarabs make up the family Scarabaeidae, in the order Coleoptera. Most June beetles are classified in the genus Phyllophaga. The scarab sacred in ancient Egypt is classified as Scarabaeus sacer. In Egypt, an important species of scarab was held sacred by the ancient, sun-worshiping Egyptians, who regarded the beetle as a symbol of immortality. 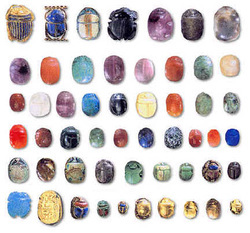 Amulets, seals, and rings in the shape of the beetle came to be known as scarabs. In ancient Egypt the dung beetle (Scarabaeus sacer) was an important religious symbol. This beetle may be seen on sunny days forming a ball of dung and rolling it over the sand to its burrow, where the ball is consumed in the following days. The Egyptians apparently shared the widespread belief that the beetle lays its eggs in this ball of dung, and saw in the life cycle of the beetle a microcosm of the daily rebirth of the sun. The ancient sun-god Khepri was conceived as a great scarab beetle rolling the sun across the heavens. The scarab also became a symbol of the enduring human soul as well, hence its frequent appearance, often with wings spread, in funerary art. Scarabs of various materials, glazed steatite being most common, form an important class of Egyptian antiquities. Such objects usually have the bases inscribed or decorated with designs and are simultaneously amulets and seals. The inscriptions are sometimes mottoes referring to places, deities, and so on or containing words of good omen or friendly wishes. Quantities of dead beetles have been discovered in burials of the earliest period, apparently to ensure the continued existence of the human soul; the later mummification of scarabs stems from the fact that they were sacred to Khepri at Heliopolis. Though they first appeared in the late Old Kingdom (c. 2575-c. 2130 BC), when they evolved from the so-called button seals scarabs remained rare until Middle Kingdom times (1938-c. 1600? BC) when they were fashioned in great numbers. Historically, the most valuable class of scarabs is that which bears royal names; these ranged in date from the 11th dynasty to the Late Period. Egyptian scarabs were carried by trade throughout the eastern Mediterranean and to Mesopotamia. Numerous examples of Greek and Etruscan imitations have also been found. Scarabs were worn by both the rich and poor as amulets, bringing protection and good luck to those that wore them. Pharaohs might have had scarabs made from gold and silver, or semi-precious stones such as carnelian, lapiz lazuli and amethyst while the common people would be guarded by glazed steatite (soapstone) or faience (a glass precursor made from powdered quartz typically glazed green or blue) scarab amulets. Scarabs and other themes of Egyptian art have long held fascination for popular culture with notable peak periods of exceptionally strong interest. One period of "Egyptomania" was sparked by the opening of King Tut’s tomb in 1922. Lalique and Alphonse Mucha designed distinctive Egyptian jewelry for Sarah Bernhardt in the 1890s. Worn on stage, these pieces became instant sensations, and cheaper glass versions became very popular. Even Cartier, and Louis Comfort Tiffany created jewelry in the Egyptian Revival style. Porter, Sandra J., "Scarabs and Egyptian Motifs of West Germany and Occupied Japan." Jewelry Crafts, March/April 2001, p.52-55. http://encarta.msn.com © 1997 - 2000 Microsoft Corporation. All rights reserved.